Hate Frog first appeared here, as one of eight demons sent to Earth to retrieve Malev'lynn. When I drew that comic I didn't expect Hate Frog to get any more screen time than the other seven demons, but before you know it, Hate Frog had become a major character and won the heart of a nation. He even blew up Fuzzball & Scuzzball's house. Eventually, Hate Frog faced off against Weirdo-Freak (start reading here . . . c'mon, it's only four pages and I'm really proud of it, take a minute to read it), and Weirdo-Freak defeated him with the power of despair. The last time we saw Hate Frog was here. It was lucky for Hate Frog that he lost that fight; since he wandered off, overcome with despair, he missed being killed with holy water like the rest of Hell's army. 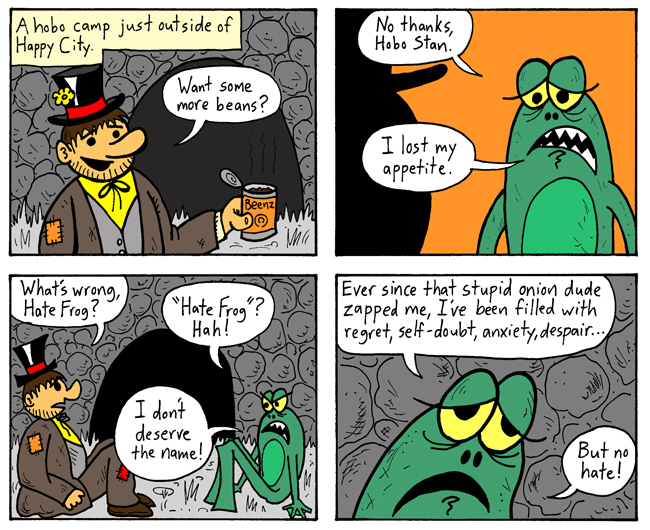 And now Hate Frog is hanging out in a hobo camp. What will become of him? Tune in next time, for more Hate Frog epilogue action!